ENGLAND faces a near do-or-die Pool A clash with Bangladesh in Adelaide next Monday to secure its spot in the World Cup quarter-finals. And a win in that match is anything but a foregone conclusion after the inept bowling display in the nine-wicket loss to Sri Lanka in Wellington. After batting first and setting an imposing 310, helped by a career-best 121 from Joe Root, England would have gone to lunch confident of beating a Test-playing nation for the first time in the tournament. 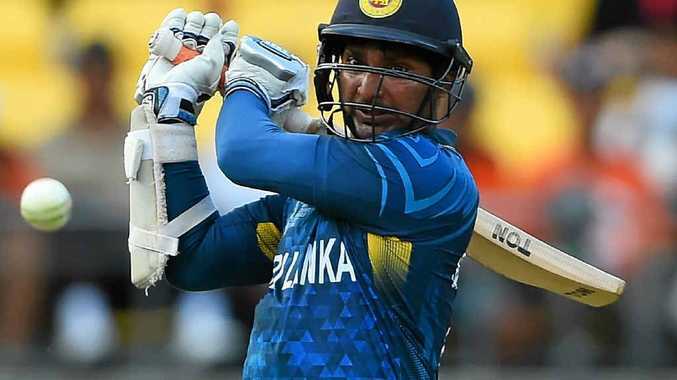 But unbeaten centuries to Lahiru Thirimanne (139) and Kumar Sangakkara (117), plus the assistance of opener Tillakaratne Dilshan (44), meant the Sri Lankans cruised to victory in the 48th over, becoming only the second team in one-day cricket to successfully chase a total of 300-plus while losing only one wicket. The English pace attack never looked threatening, seamers James Anderson (0-48 off 8 overs), Stuart Broad (0-67 off 10), Steve Finn (0-72 off 9.2), and Chris Woakes (0-54 off 8) all falling into the trap of bowling far too short and wide. Thirimanne, 25, suffered some early jitters amend was dropped on three and 98, but eventually registered his fourth one-day ton and the highest score of his career. He also became the youngest Sri Lankan player to score a century in a World Cup. Sangakkara, playing in his 401st one-day international, proved once again why he is one of the best players to have pulled on a pair of pads. The victory, Sri Lanka's third in four games, consolidated the 1996 World Cup winners in second place behind New Zealand in Pool A, and almost certainly guaranteed its place in the quarter-finals. England on the other hand has won just one of its four matches, and must beat Bangladesh and Afghanistan to have any chance of progressing.